Throughout our history, our philosophy has been to make good, comfortable shoes, based on anatomically-shaped lasts, top quality material and high-level craftsmanship, and to provide any foot with the room it needs. Extra width and volume fitting shoes: footwear that adapts to each and every foot, not the opposite. We offer a considerable range of stylish wide-fit shoes, from casual to formal, that can be found across all the collections. LASTS :: A last is the wooden, metal, or synthetic mould over which the footwear is constructed, and is used to determine the shape, volume and size of the shoe. Lasts can have different shapes and sizes, and each last is designed for a particular heel height, toe shape, and type of footwear. For custom-made shoes, a last will be specifically built to resemble the shape of the wearer’s foot. TYPES OF LASTS :: Klaveness works with three different concepts: standard, adjustable standard and orthopaedic lasts. We can make individual adjustments to any of our lasts, in any width or required size. Women lasts range from 1-10 UK sizes, and men’s from 35-52 EU. Achieving the perfect shoe fit doesn’t merely enclose shoe size, but also shoe width. The shape of the shoe must meet the shape of the foot. That is why our collection features several different widths: F, G, H, J, K, L, M, N, O, S and T. F is the narrowest width and T the widest. Each style is available in the stated width. 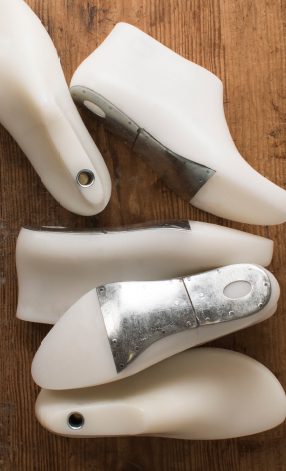 Most of our shoes are built with extra volume so they can comfortably accommodate customised foot orthotics.